Literary Hoots: Mix It Up! Ever want to finger paint without the mess? 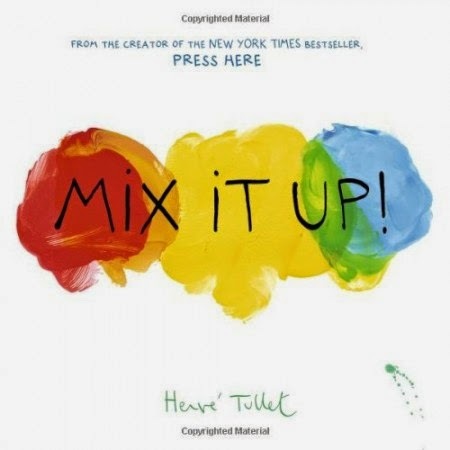 From the author of Press Here comes another interactive experience for readers: what happens when you mix paint colors? Try pressing the pages together, shaking the book, or dabbing with a finger to see the colors combine. Just watch out for the splatter. It's genius. Hervé Tullet is thoroughly impressive in his ability to get kids' imaginations going. And, you seriously get to finger paint without the mess. It's educational: a comprehensive exploration of the color wheel, plus shades and tints. It's a win-win-win situation. I loved Press Here and this is the perfect companion to it. I definitely recommend it. It works really well to read one-on-one with a child because it demands interaction. If you were to read it in a class or storytime setting, I think it would be a lot of fun to have the kids imagine they each had the book in their hands. Then they can all do the actions with you. Really, you can have a lot of fun with this. Especially if you are willing to get actual finger paints out to explore the world of color. Enjoy!